What's your favorite Mackinac Island smell? Mal: The smell of fudge is okay but not my favorite island smell. My favorite smell is the scent of popcorn from the candy stores. I love popcorn with butter, of course. Next would be the smell of the water's edge. Sometimes you can find interesting dead things washed ashore. I like to roll in those. Mella: Really, Mal, you are such a dog. I like the water, too. Fish is my favorite smell. The fresher the better. What's your favorite thing to do on the island? Mella: I like to roam the island and take the the occasional hitchhike on a horse draw carriage. It's good to keep an eye on your territory and make sure everything is ship shape. The view from the carriage is pretty cool. The tricky part is jumping off. Sometimes a horse will back up and you have to make sure you're clear of the wheels. Mal: My favorite part is greeting all the guests at the McMurphy Hotel and Fudge Shop. So many interesting people to give me pets. I especially love the kids because they will pet me nonstop and even slip me a treat or two. What's Allie like when she's not investigating a crime? Mal: Allie is the best. She loves me and plays ball with me and feeds me and likes to pick up my poo. Mella: She doesn't like to pick up your poo, kid. Trust me on that. I picked Allie. She has a good heart and accepts me the way I am without too much fuss and bother. I don't like people who fuss over me. What is your advice for people who travel to Mackinac Island? Mella: If you can, you should stay on the island at least one night. It's quiet and peaceful and a different place when the crowds go home for the day. Mal: Roll on the grass of the big lawn at the base of the fort. It's like the best thing ever and you might even get to roll on something dead. Great to have that smell in your fur. Thanks for the talk. 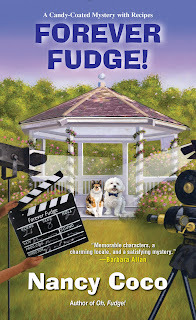 There is a giveaway as part of the Killer Character Cozy Up To Summer giveaway. Leave a comment below about what you think your pet enjoys most about summer for a chance to win a book. If you don't have a pet, then what you enjoy most about summer will do. Good luck! I'm in Arizona so I don't think they like anythink, The air is cranking out and 4 cats are laying on my bed were i have a fan blowing on them!!! They love the fan!!!!! Ralph loves to play in the kiddie paddle pool. It's all his which he loves too. Pep loves the long nights sitting outside with Grandpa, feeding the fish and enjoying the smells and sounds. Thanks for the giveaway. My cats love to spend time sleeping in a sun beam. I think my cats favorite thing about summer is getting to sleep by the AC vent! My elderly dog has taken to putting her nose and paws on the floor vent, sucking in that cool air. My dog enjoys relaxing on the porch. My dog loves all of the smells outside. My cats love the activity outside the window! Summer should mean leisurely reading. My kitty like to watch the birds outside the window. My cats, Hamilton and Jefferson, love having the windows open and watching the birds and everything going on outside. One one of my 3 indoor-only cats adores he sun. We have extra-deep window wells and he will lay in one, fully stretched out, flat on his back, with neck stretched and all 4 paws straight up in the air. He can do this for hours. I think he is the original "Sunshine Boy". Our dogs love air conditioning best (us too). For Lacey is definitely enjoys the smell of food anytime. Sadie loves smelling different animals in the yard like squirrels,birds, ect. She loves just sitting somewhere and runs when she sees something. Always on the hunt! My cat Lily enjoys being in front of the sliding screen door hearing the birds and watching them land on the patio. She'd love to get out there but, alas, she's an indoor kitty. Thanks for a chance to win. I always enjoy seeing beautiful flowers,hearing the ice cream truck,eating garden fresh vegetables and watching the fireflies during the summer. Our Moonie has dug herself a couple of deep holes and she likes to lay in them when it’s hot out. Thanks for the chance. My cat, Yoda, loves naps on my lap and belly rubs. Most of our dogs prefer to stay in the house where it's air conditioned but, the youngest one, the 8 y/o dachshund, likes to go swimming in the pool if someone will watch him.